AquA AnimaniA is your #1 local source for outdoor garden pond liners. Today, more and more homeowners are looking at their yards and seeing an opportunity to expand their home living space. Professional landscape architects agree that a renovated outdoor living space enhances leisure time and adds value to a home – and ponds and water features are among the most requested landscape designs. 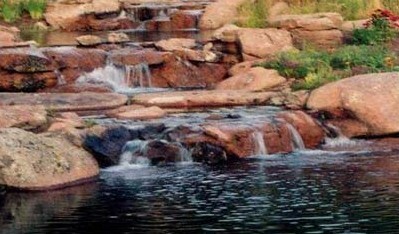 Each year, thousands of decorative water features and ponds are installed using pond liners. These water features help increase the appeal and value of private homes around the world. Combining flexibility and ease of installation with lasting durability, pond liners are the perfect choice for creating unique water feature designs. In fact, when it comes to creating a backyard oasis, the only limit is your imagination. To assure dependable performance in demanding environments, we proudly feature Firestone PondGard rubber pond liners. Firestone PondGard EPDM pond liners are engineered to provide dependable performance in a variety of critical containment applications. Based on EPDM (ethylene propylene diene terpolymer) synthetic rubber, PondGard is a highly flexible, stable waterproofing membrane. Specially formulated to be safe for fish and plant life, PondGard pond liner can easily be shaped to fit the unique contours of any size pond or complex landscape feature. PondGard shows outstanding resistance to the harmful effects of ultraviolet radiation (UV), ozone, oxidation and other environmental conditions. It requires little or no regular maintenance once installed. Applicable projects range from simple back yard decorative ponds to highly engineered, potable water reservoirs and constructed wetlands applications. Landscape Design professionals recognize Firestone PondGard pond liner as the geomembrane of choice for critical containment applications. The PondGard Advantage is its ease of installation even in remote areas. No thermal welding or utilities are required for installation or repair.